Happy Friday Fawn Friends! 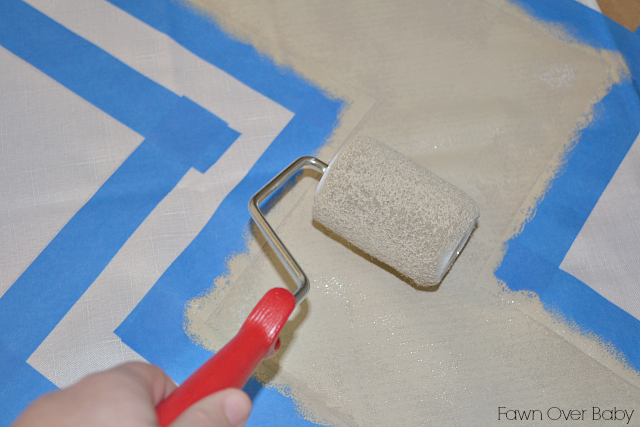 It's time again for me to share another DIY project from McKenzie's New Nursery! 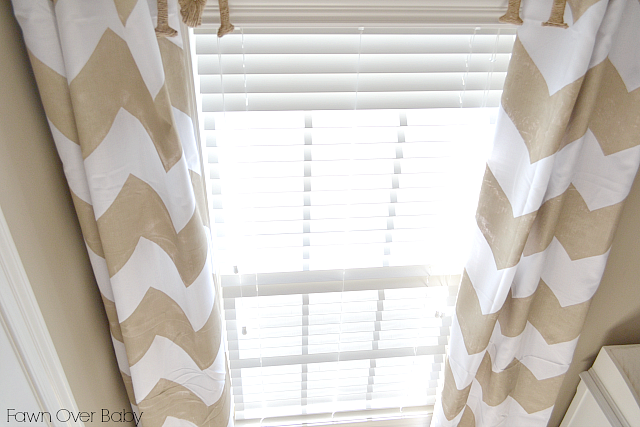 Today I am sharing my tutorial on How-To Make No-Sew Chevron Curtains! I absolutely love how they turned out, flaws and all. This tutorial is going to get very real as these panels took a lot more of my time and patience than I would have liked. Before I begin, I just want to inform you that if you decide to tackle this one on your own, you are looking at a 3-4 day turn around. I highly suggest you enlist help with this one - that's if you decide you want this exact look that I am showing you today. 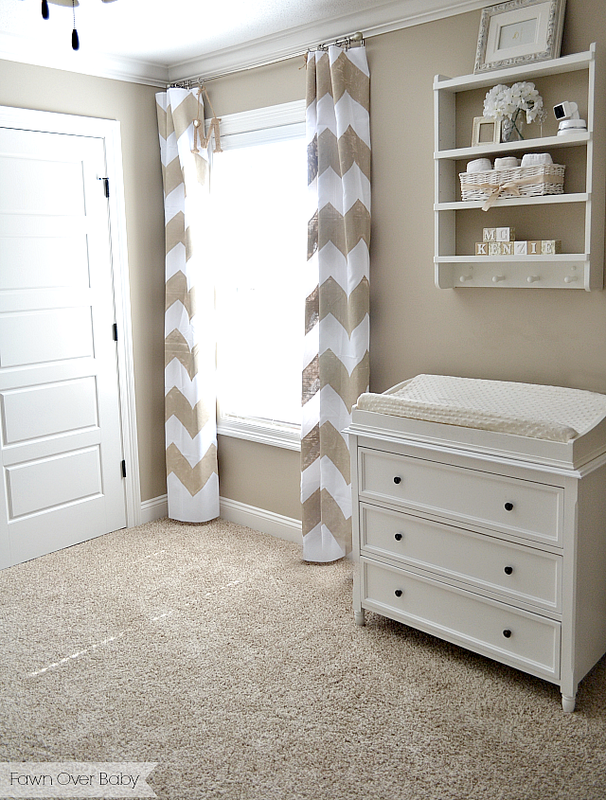 When I began my journey to improve my daughter's room, I knew right off the bat that I wanted Chevron displayed somewhere in her space. I just can't get enough of this fun pattern (in small doses of course). 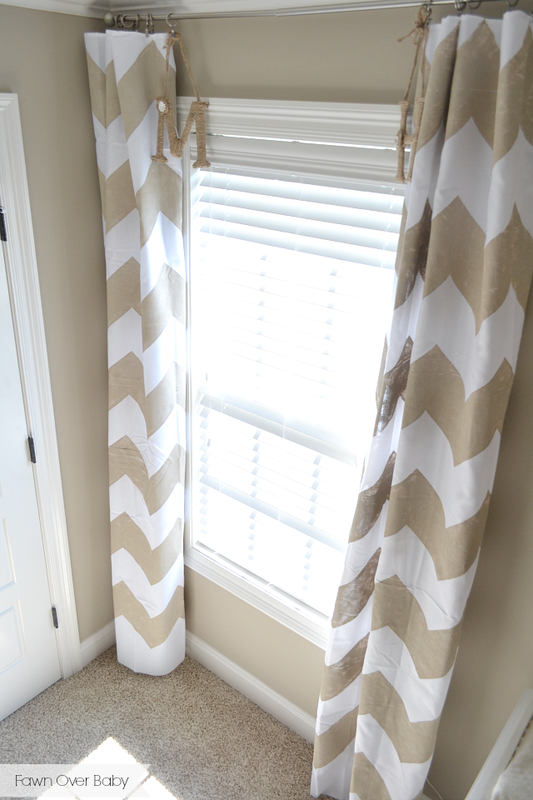 I decided that curtain panels would make for the perfect pop of chevron that would coordinate well with the white triangle decals opposite this wall. This decision then led to an extensive online and offline search! 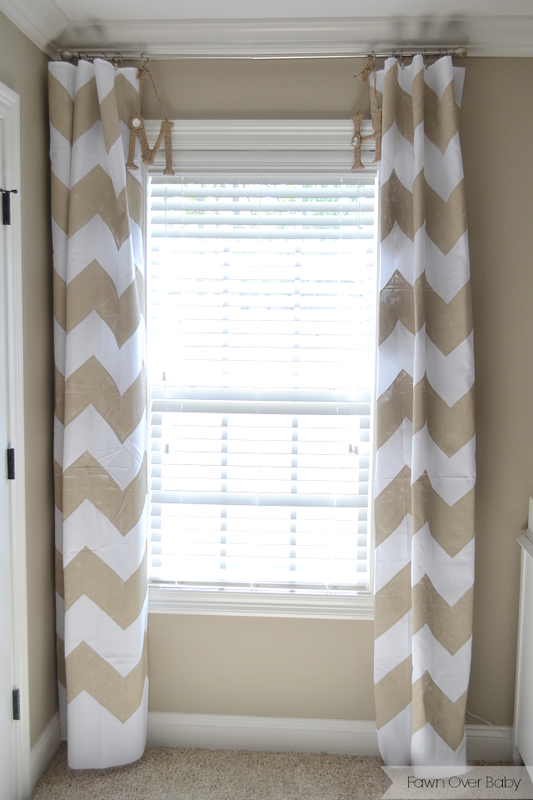 I searched high and low for beige chevron curtains with a medium size pattern that didn't break the bank. Having no luck, I caved in to the idea of making them myself. I have absolutely no sewing skills whatsoever, as you may remember me explaining in my DIY Now Sew Teepee Tutorial last year. 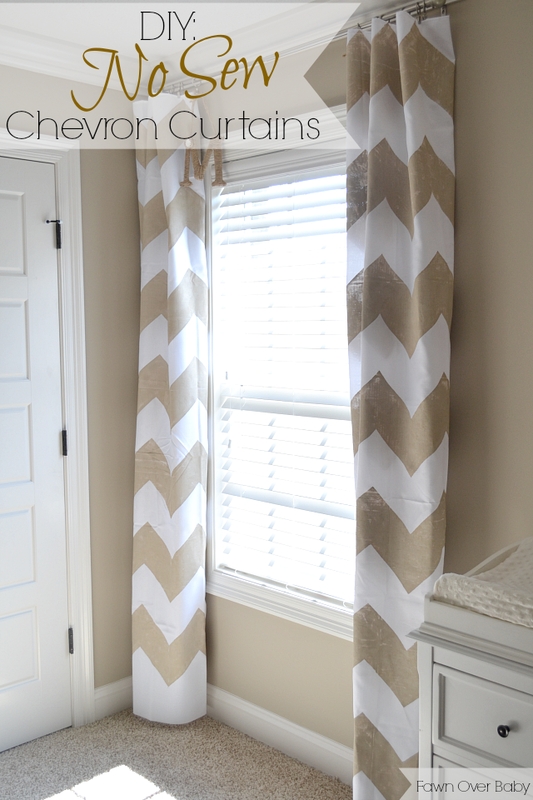 I found many tutorials online on how to create your own chevron curtain here, here & here These tutorials are great and definitely helped me narrow down a game plan, however I wanted my chevrons smaller and a little closer together. Looking back, I wish I opted for a less time consuming chevron pattern such as a larger size or maybe just trim it out in chevron instead of covering the entire panel. 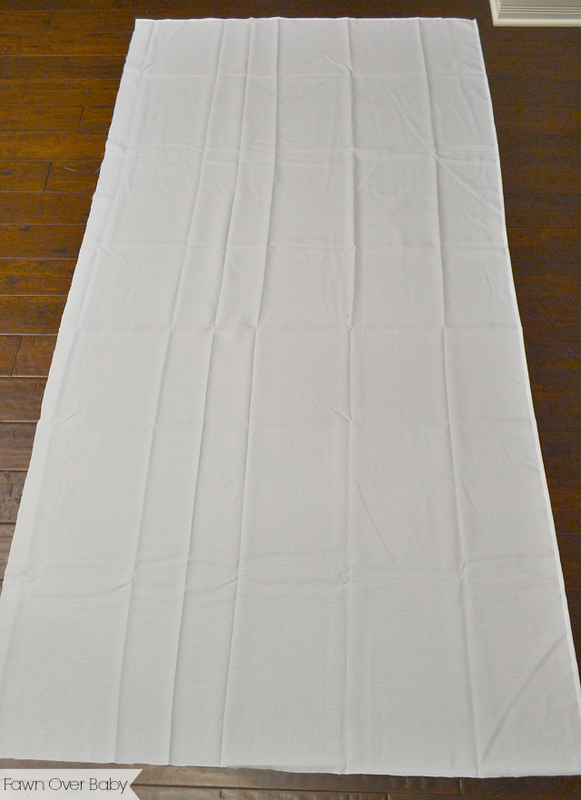 With this smaller size and length of curtain, it took quite a looong time to prep! If you are a no-sewer (like me), I've suggested a few different options and/or approaches that I learned along the way that might help make this process go a little easier for you and produce a sharper outcome. Now that I've scared you off before we even get started, Let's Dive In! 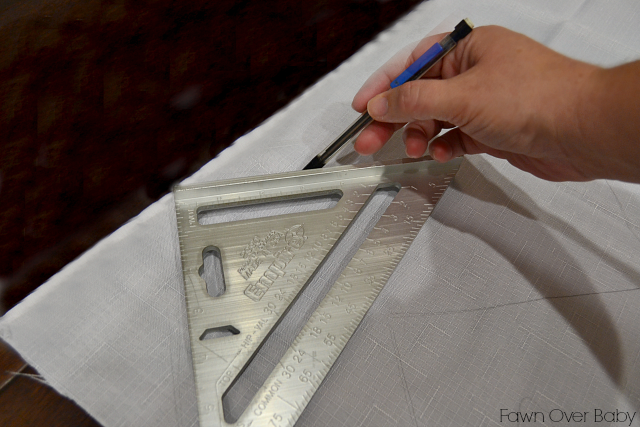 1 Triangular Ruler ( I used my husband's carpenter speed square)- Depending on the size of chevrons you prefer, this works as a perfect template to trace your triangles. Pencil or chalk(not pictured) - A pencil worked fine for me, however chalk might be a little easier to see. 1. At first I planned on using each tablecloth(as-is) for my panel. After measuring the window area, these were simply too wide for my tiny little space on each side of the window. So I modified the dimensions by cutting them to the width and length I needed. I then used Stitch Witchery to hem the rough edges. First I would iron your panel before you begin. The wrinkles will become a headache down the road as you trace your chevrons. Take it from me, I did not iron before I started and I so wish I had. 2. 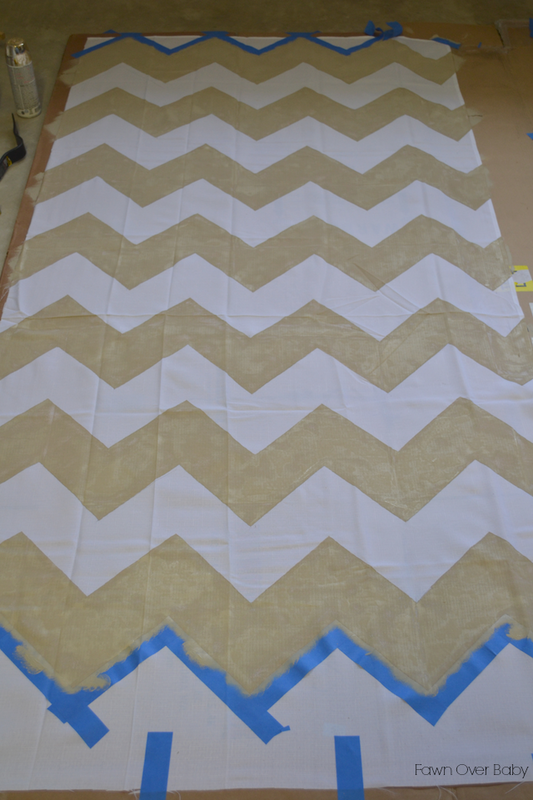 I traced my first chevron by placing my triangular ruler at the top left corner of my panel, right below the top hem. 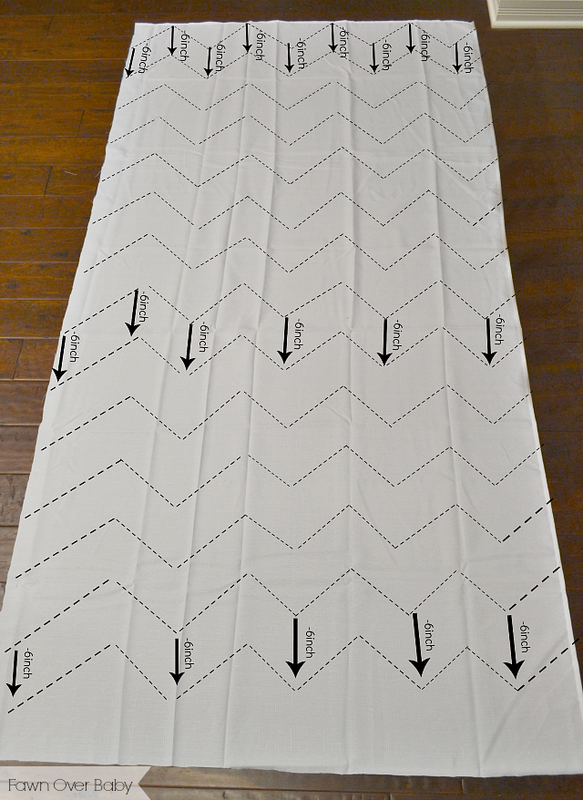 Trace only the sides, this will create the top portion of your chevron. Then continue tracing, making your way horizontally across the panel. 3. When you begin your second row (& thereafter) measure 6 inches down from the points of your chevron above, then mark your new points with an "X". Line your triangular ruler up to those "X's, then trace your new chevron triangle. 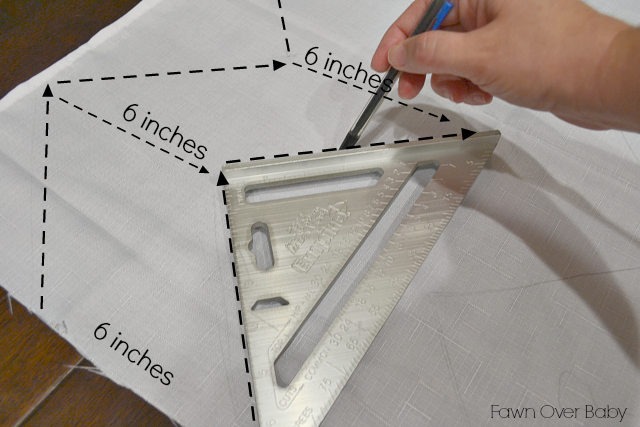 As you create new rows, you might want to tape the corners of your panel down to help keep it taught (or have your helper hold in place) so that your fabric will not begin to bunch, compromising your measurements. 4. As you can see here, I had a loooooong way to go. 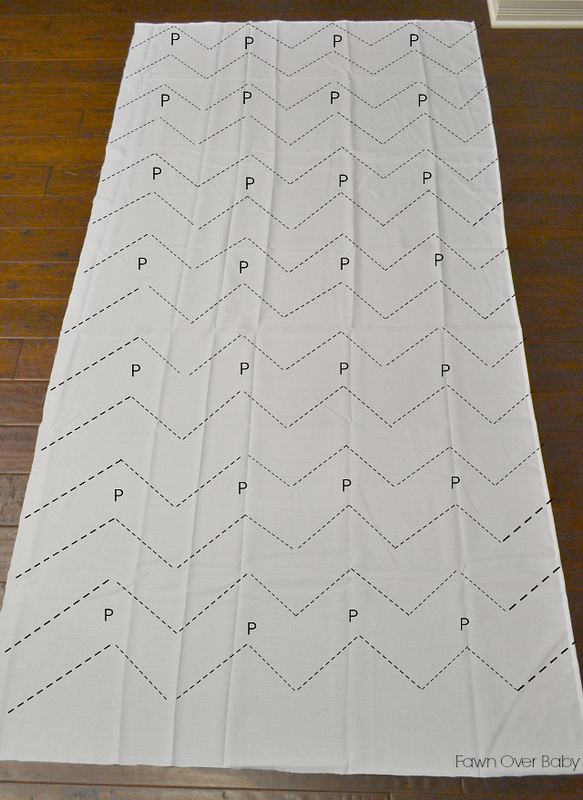 After my third row of measuring, pulling panel taught then tracing, I was about over the whole chevron tracing process. This is when it dawned on me that it would take a lot of chevrons to fill up this lengthy panel and I still had another panel to go. 5. 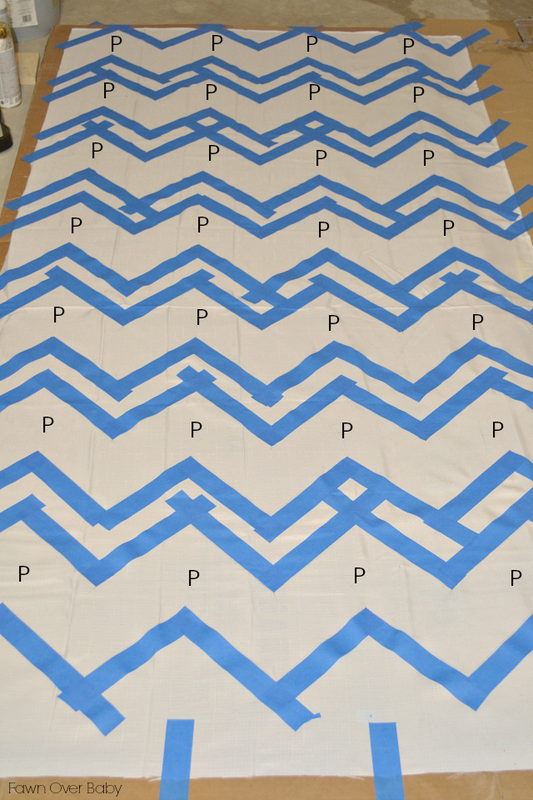 After all chevrons are traced, mark the rows you choose to paint with the letter "P" - so you don't accidentally paint the wrong row. I wanted White and Beige. If you choose to rotate several colors, just mark the rows with the first letter of the corresponding color of choice. This helps to keep you sane and organized as you start the painting portion later on. 6. Now it's time to tape off your chevrons. Make sure that you place your tape on the outside of your traced lines. That way they get covered up with paint when you start painting next. 8. Next I rolled my paint on. 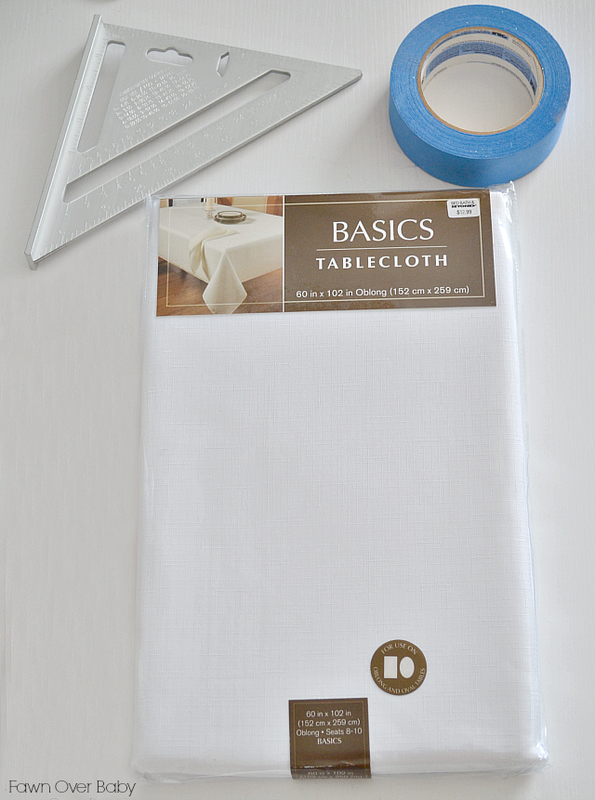 This is where it became tricky for me because I used tablecloth instead of a tightly woven curtain panel. The paint seeped through the tablecloth and dried onto the cardboard underneath. 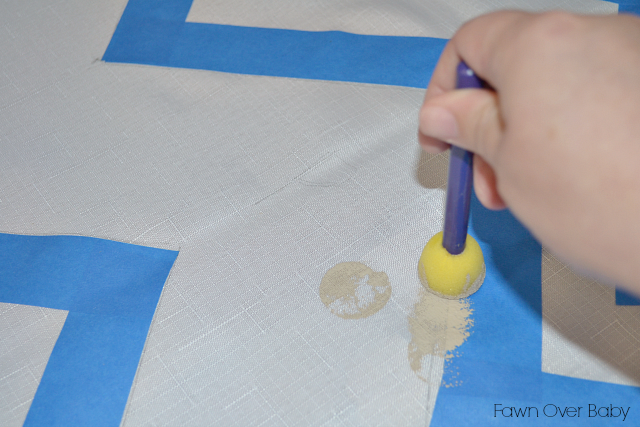 When I went to pull the tablecloth up, not all of the paint came up with it -creating a splotchy "weathered" look. If you don't want the "weathered" look, true curtain Panels or even painter's Cloth cut to size would be a better option for painted-on patterns. 9. 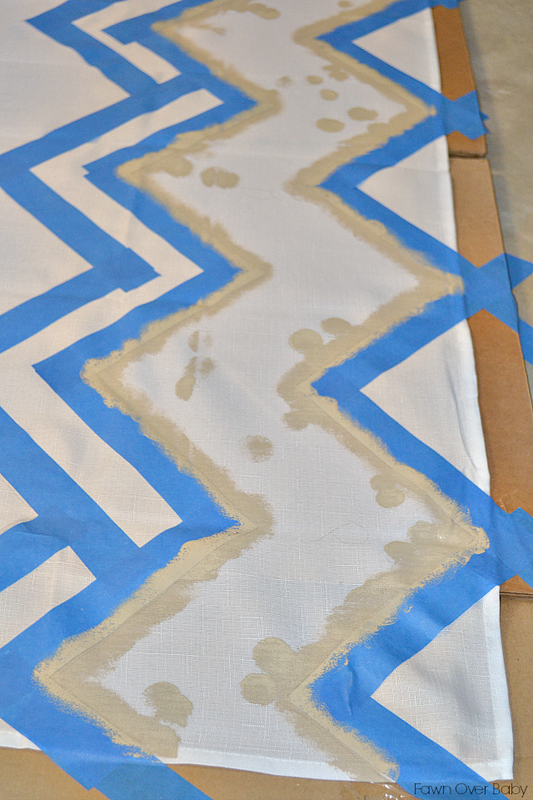 Once you paint your last chevron, you are clear to peel the tape off starting from the top, then let it dry overnight or one full day. I kept my top and bottom tape on, as it held my curtain down while drying in the garage. As you can see, the splotchiness is really apparent in these photos. I actually went back over a few areas with another coat of paint. 10. Once all is dry, hang up with ring clips onto your curtain rod of choice and ENJOY! See the "weathered" look isn't so bad. It's sort of like a rustic worn design that you would find at Restoration Hardware or Pottery Barn, right? I hope you enjoyed this tutorial and took notes of the recommendations I shared along the way. I would love to see your version of this DIY! Feel free to email me your finished product and/or leave a comment with any thoughts or suggestions you may have! Fabulous that you used a triangle as your guide. What a lot of work, but it paid off! I love the paint effect on the curtains! Makes it look way rustic and cute. LOVE!! you really have some of the best DIY projects. thanks for sharing! Thank you so much Meghan! They all stem from being on a budget. Thank goodness for Pinterest lol! Your curtains turned out fantastic! How long were the sides of your triangle? I don't have one, so was hoping to use the pointed edge of cardstock to measure out my chevron pattern and want it to match the width of your pattern. Thx! They are 6 inch on each side. :) Good Luck!!! What color is the paint on the wall specifically? Can you tell me what paint color is on the walls? I'm sorry Jekka. The walls were painted this color when we moved and no trace of an extra can anywhere. Its definitely a light beige. Where did you get that shelf over the changing table? Or what might it be called if I tried to search for one?